The atmosphere is opaque to IR radiation emitted from the Earth’s surface for the main CO2 absorption bands. Radiation to space in these bands then takes place in the upper troposphere where temperatures are much colder due to the Lapse Rate of 6-10 degrees/kilometer. As CO2 concentrations increase over time the fog gets a bit thicker, and the effective height where the fog clears moves to a higher level where the temperature is lower, thus reducing heat loss. As a result of all this the Earth’s surface warms slightly, increasing the outgoing IR radiation until the overall energy balance is maintained. This is my understanding of the CO2 greenhouse effect. Radiation transfer calculations based on this theory  result in a logarithmic dependence of the radiative forcing (extra heating effect), as follows. where C is the CO2 concentration at some time and C0 is a reference value for defining deltaE. So a doubling of CO2 concentrations will give an additional radiative forcing of 3.7 watts/m2 (5.3ln(2)), and a quadrupling of CO2 would give a radiative forcing of 7.3 watts/m2 above the baseline. The logarithmic dependence ensures a diminishing return for ever increasing CO2 concentrations for the radiative forcing. The simple model underestimates the observed rise but the shape is reasonably good. A better fit is given by the red curve using 2.5ln(C/C0). It is also possible that there are other natural warming trends present particularly recovery from the little Ice Age, which lasted until the end of the 19th century. If this simple formula has validity, then it predicts that by 2100 average temperatures would have risen above current values by just 0.7 to 1.0 degrees C, even if no reduction in CO2 emissions occurs in the meantime. 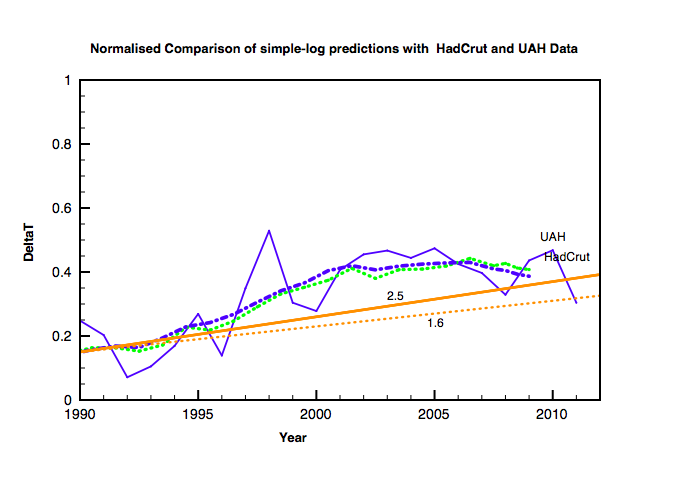 To be fair considering what I wrote in the last post comparing IPCC 1990 predictions to data from 1990 to 2011, I enclose below a new comparison between the data and these two new simple predictions. The 1.6ln(C/C0) line also appears to be rather too low despite the limited range of data available. Disclaimer: I fully admit that I am not an expert on climate science, with only a superficial knowledge of the detailed ocean/atmosphere interactions, or the various feedback mechanisms with water vapour, CO2 outgassing etc. that have been parameterised in various climate models. I accept ahead of time criticism on this point. Perhaps the increase of the constant from 1.6 to 2.5 required by the data parameterises the climate sensitivity response to past warming. Perhaps a natural recovery from the Little Ice age due to increased solar activity is mixed in as well. This entry was posted in Climate Change, Physics and tagged Climate Change, CO2. Bookmark the permalink. There isn’t just a solar radiation component mixed in, a negative forcing by aerosols is likely mixed in as well, which have had a dampening effect on the temperature increase in the last century. Also, you assume an instantaneous response of the temperature to the forcing by CO2 restoring equilibrium right away for your fit. However, in reality, due to the large heat capacity of the oceans, the response of the temperature to the increase in greenhouse gases has been delayed by decades. The globally averaged energy balance is not in equilibrium. The temperature increase we see today, is likely the response to the increase in greenhouse gases some decades ago. Interesting. Jan suggests that temperature increases will lag CO2 level increases. The amount of outgoing radiation is highest during the day. By nightfall, the outgoing radiation has lessened considerably. So while the equilibrium may not be instantaneous, it should be attainable over the course of a single day. There is no mechanism by which CO2 can store the energy for decades. The heat capacity of the oceans is a different beast and has little to do with the level of CO2 in the air. That is mostly affected by the amount of sunlight it receives as governed by cloud cover. The oceans regulate the air temperature — not the other way around. This is clearly seen by comparing the dissimilarities of the northern and southern hemispheres the latter of which has much more ocean coverage. Clive, your graphs are interesting, but as Jan notes, the oceans are important. Their cycles are about 60 years long. Your top graph starts near the bottom of a cycle and finishes near the top of a cycle. Your least means squared will be influenced by this choice. That we are near a peak is easy to see. Your second graph shows an increase from about 0.15 to 0.4 from 1990 to 2001. The slope of the line is the trend. That trend is fairly high. Since then, the trend has been a plateau. That is also what leads some to hyperventilate over the fact that the top 10 warmest temperatures on record are in the past decade. The fitted line in your first graph is interesting, but it is not indicative of the background trend. Unfortunately, to incorporate the oceans into the definition of natural variation, the time span for climate would have to be increased from the IPCC’s 30 year definition to at least 120 years, so two full cycles could be shown. That would be the minimum needed to show changes in the background trend. Politically, that is a non-starter though. So while the equilibrium may not be instantaneous, it should be attainable over the course of a single day. There is no mechanism by which CO2 can store the energy for decades. John, the atmospheric layer with the CO2 will adjust relatively quickly to the changed energy balance in this layer, when CO2 changes, but the whole climate system is not in equilibrium yet. For simplicity, assuming no other forcing changes, only CO2 increases, the absorbed fraction of the incoming solar radiation stays the same at the surface, but the amount of thermal radiation radiated back to the surface increases. There is a disequilibrium of longwave radiation at the surface, with the net flux into the surface, which warms up the ocean. Due to the large heat capacity of the oceans it takes decades until a new equilibrium has been reached. 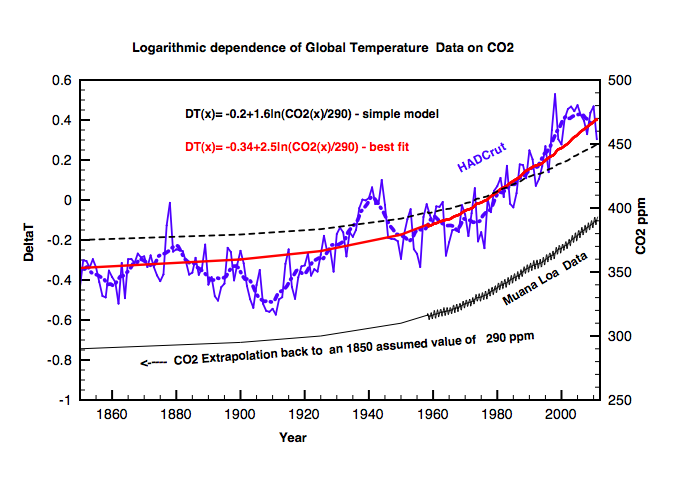 So there is a time lag between CO2 and equilibrium surface temperature. The heat capacity of the oceans is a different beast and has little to do with the level of CO2 in the air. The heat capacity of the oceans doesn’t depend on the CO2 in the air, but the response time to a changed net energy flux between oceans and atmosphere, e.g. due to an increase in atmospheric greenhouse gases, depends on the heat capacity of the oceans. That is mostly affected by the amount of sunlight it receives as governed by cloud cover. Well, not the heat capacity. The amount of energy the oceans receives at the surface, in the form of solar radiation, thermal radiation, latent heat flux (negative), sensible heat. In equilibrium, the net flux is Zero, averaged over the globe. The oceans regulate the air temperature — not the other way around. Heat transfers from areas of warmth to areas of cold. There may be a minute amount transferring back the other way, but since the vast majority moves from hot to cold the modicum that transfers the other way can be ignored. In other words, the surface that was warmed by the sun radiates out to the coldness of space. The net flux of energy at night is outward. CO2 molecules simply slow this rate down, but the clear nights still cool down by many degrees Celcius. At night, the ocean surface is warmer than the air, so heat goes from the ocean through the air to space. There may be a few small areas where the warm tropical air is blown over the ocean such that the air is warmer than the water at night, but by and large, the ocean heats the air. Here again, the modicum that transfers the other way can be ignored on cloudless nights. It is not a 2 way street. It is simply thermodynamics that dictate that heat will move from warm to cold. You brought up latent heat which is when the sunlight evaporates the water instead of being absorbed by the water. This cools the surrounding water down as the sensible heat is lost to latent heat. This is just another mechanism for transporting energy from an area of warm (ocean) to an area of cold (troposphere). You were only discussion radiation as that was what Clive was concentrating on. I don’t mind dropping latent heat transfer as a topic for today as it is beyond the matter investigated by the original post. And we haven’t even touched on black body radiation yet! Clive. I hope you don’t mind Jan and I having a discussion here. She is correct that the CO2 molecule will, less than half the time, radiate energy back to the earth. This happens within a second of the molecule absorbing the energy in the first place. Just looking at radiation, like your post theorized, the energy given up by the CO2 molecule will most likely be at a longer wavelength. It will travel back down toward the earth and will be absorbed by a molecule in the air or on the surface. If it is absorbed by a gas molecule in the air, then that molecule will more than half the time re-radiate that energy back toward space most likely at a longer wavelength. Similarly, if it reaches the surface, the solid or liquid is much more dense, so ignoring conduction is problematic. Regardless, the cycle begins again with that energy being re-radiated back toward space at a longer wavelength. This does not take much time as can be noted how quickly the air cools on a clear evening. In the past 5 hours, the air at my local airport has reportedly lost 6 degrees C.
No not at all – this discussion is fascinating. For the simple model proposed for a temperature response to CO2 forcing, I agree that the Earth’s surface needs to restore energy balance to a step increase in CO2 on a time scale of the order of a year. 1. The response of the land surfaces to increased forcing must essentially be instantaneous. For example temperature swings between night and day in the Sahara desert can reach 40 degrees. One good reason for this is that the most important greenhouse gas H2O is essentially absent above the desert. For this reason probably a good place to look for a measurable response to increases in CO2 concentrations would be changes in night time temperatures in the Sahara. We also know that land surface temperatures respond rapidly to changes in water vapor content – humidity. So why would CO2 be any different ? 2. The Oceans are different. They obviously have a huge heat capacity and will respond slower to radiative forcing. However for outgoing IR radiation it is just the Ocean surface temperature which matters. Seasonal variations in surface temperatures demonstrate that there is about a two month time lag between the summer solstice maximum solar intensity and the warmest water temperatures. So for example here in Britain water temperatures vary between 5C in winter and 18C for the summer month of August – a range of 13C. Therefore it would appear that the surface ocean temperature does respond to radiative forcing (of the sun) with an apparent thermal inertia of around 2 months. You may then argue that the Ocean never has time to reach thermal equilibrium between winter and summer, so that if hypothetically one Earth year was 10 times longer then we would have greater extremes of seasonal sea surface temperature. However, in the tropics where the solar radiation is highest all year round we don’t see the extreme temperature that we see for example in deserts. The Oceans have their own thermostatic temperature control. loosing heat by evaporation which leads to clouds and thunderstorms which cool down the surface. John: Are you saying that 60 year cycles in the ocean are a natural climate phenomenon independent of CO2 ? Jan: Are you saying that the Ocean needs decades to mix and disperse heat downwards or that the mixing layer needs that long to react ? Incidentally, I have been unable to respond until now because I was on the “Norfolk Broads” for a couple of days without any internet connection. The Norfolk Broads are a product of past climate change. Ancient Britons dug peat for fuel for 400 years or more. Then between 1300 and 1500 sea levels rose flooding the excavated “broads”. During Roman times the sea was even higher still. Because it absorbs fewer wavelengths than does water vapour. Most of the sections of the spectrum that CO2 absorbs is also absorbed by water. Your idea about the desert is also the same idea of the other large deserts known as the poles. They are expected to warm most quickly. The approx. 60 year cycles of the oceans are independent of the level of CO2. The cycles can be seen in the HadCRUT data long before CO2 levels started to skyrocket. About the mixing of the water, water gets more and more dense as it cools until about 4C when it starts to become more buoyant. When the surface water cools by giving its sensible heat to the latent heat of evaporation, that cold water sinks. That is why the surface remains warmer than the lower layers even at night. No, actually that’s not correct Jan. The oceans tend to dominate the relationship in most cases, with the air having little if any effect on changing the oceans in general. Now the way the air can have an effect is when a warm, dry air mass moves off the land and prevents a marine layer from forming, thus allowing the sunlight in to warm the ocean, but you see it’s the sun, not the air, that’s doing the job. I’m a bit curious, Jan – what do you have invested in the lie that is anthropogenic global warming that you’re so committed to keeping it alive? Haven’t you been paying attention to what’s going on currently with the sun in particular, along with all the bitter cold winters that have been reported all over the world with snow in places where nobody living could remember it? I know it’s only “weather”, not “climate”, but didn’t you hear that the southwest coast of the U.S. pretty much skipped summer last year?